Scarlet Monkey Flower, Upper Winter Creek. Monkey Flower as seen between Hoegees and Mt. Wilson in the Winter Creek. These two photos were taken recently along the Winter Creek, between cabin #139 and Mt. Wilson’s summit. Scarlet monkey flower (Mimulus cardinalis) and Common monkey flower (Mimulus guttatus) can be seen growing in moist sands along the stream bed, especially above 3,000′ in elevation. 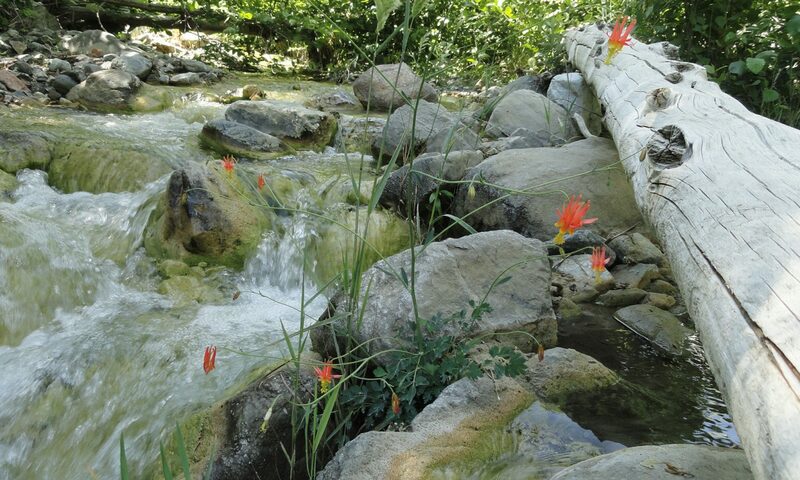 These colorful flowers add a splashy beauty to the speckled granite boulders and light sandy stream sands.